Here at HCS we build all types of Handguns from silhouette pistols to custom barreled single action revolvers. We perform caliber conversions on many different types of revolvers, Ruger Blackhawks and Bisley models are the most common. 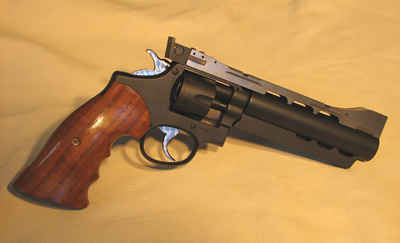 We also build target and hunting revolvers such as the short cylinder PPC gun shown here. 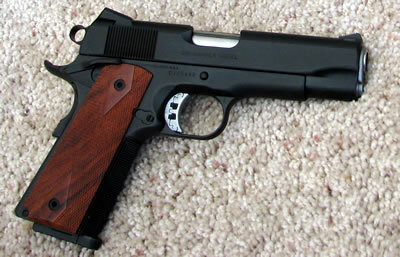 We provide custom 1911 style pistol work from the standard accuracy modifications to full blown match guns. The 1911 pistol makes a great target gun with proper accuracy work and precisely fitted match quality parts. 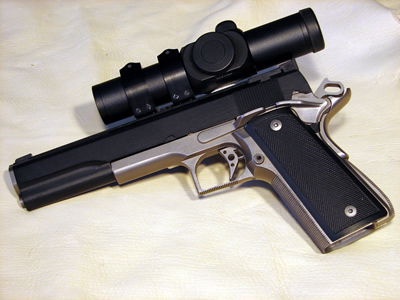 The 1911 can also make a fun and accurate hunting pistol in the full 10mm auto round. The cartridge has the punch for close range work or animals up to deer size game. So whether you're looking for a custom revolver for hunting or a super accurate match pistol, HCS has the tools and expertise to build something special just for you.